Playtex, one of the leading manufacturers of children’s products, has recalled over 3 million dining sets after receiving reports of children choking on unexpectedly detached plastic. The brand has a history of product safety issues (particularly in the cases in the 1980’s concerning toxic shock syndrome). In recent years, the company has struggled to avoid scrutiny, but came under legal fire in 2008 when a parent sued the company for failing to disclose the presence of bisphenol A in infant bottles. 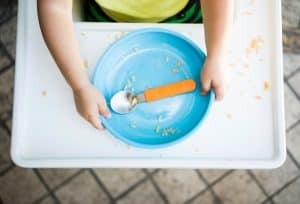 The specific defective product being recalled is a series of polypropylene children’s dining ware. Each piece has a clear plastic layer as part of the plate or bowl. This layer has been reported to bubble or peel. Children can ingest small pieces of the plastic, which could lead to choking. To date, four families have reported that their children have choked on the plastic, and 11 families have reported finding the plastic in their child’s food, per the Consumer Product Safety Commission. Over 370 customers have noticed the plastic layer peeling or bubbling. Because the Playtex items are sold both in local Phoenix stores and online, the scope of the recall is massive. The company estimates at least 3.6 million of the recalled plates and sets were sold in the U.S. alone, and an additional 1.9 million in Canada. The recalled products were sold by Amazon, Babies“R”Us, Target, Walmart, and other retailers between October 2009 and October 2017. If you purchased this product, you can call Playtex toll-free at 888-220-2075, from 8 a.m. to 6 p.m. ET, Monday through Friday. You can also visit http://www.playtexplatesandbowls.com/. At Plattner Verderame P.C., we work with honest people who have suffered honest injuries from dangerous and defective products. We take these cases on a contingency-fee basis, which means you don’t owe us anything unless you win. Call us today at 602-783-8793 or contact us to find out how our Phoenix lawyers can assist you in having your voice heard if you have been injured by a defective product.